Some image types, such as those found in convolutional neural networks (CNN), differ from a standard texture in that they may have more than 4 channels per pixel. 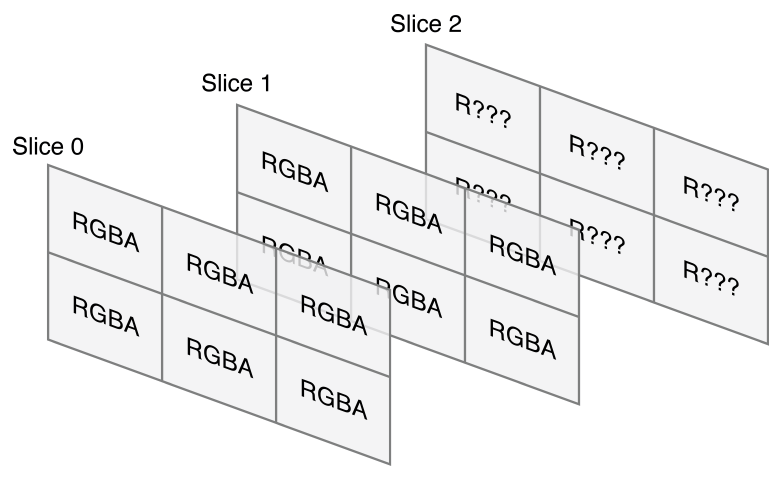 While the channels could hold RGBA data, they will more commonly hold a number of structural permutations upon an RGBA image as the neural network progresses. It is not uncommon for each pixel to have 32 or 64 channels in it. The layout of a 9-channel CNN image with a width of 3 and a height of 2. An MPSImage object can contain multiple CNN images for batch processing. In order to create an MPSImage object that contains N images, create an MPSImageDescriptor object with the numberOfImages property set to N. The length of the 2D texture array (i.e. the number of slices) will be equal to ((featureChannels+3)/4)*numberOfImages, where consecutive (featureChannels+3)/4 slices of this array represent one image. The starting index of the image to process from the source MPSImage object is given by offset.z. The starting index of the image in the destination MPSImage object where this processed image is written to is given by clipRect.origin.z. Thus, an MPSCNNKernel object takes the n=clipRect.size.depth image from the source at indices [offset.z, offset.z+n], processes each independently, and stores the result in the destination at indices [clipRect.origin.z, clipRect.origin.z+n] respectively. Thus, offset.z+n should be <=[source numberOfImage], clipRect.origin.z+n should be <=[destination numberOfImages], and offset.z must be >=0. For example, suppose an MPSCNNConvolution object takes an input image with 16 channels and outputs an image with 32 channels. The number of slices needed in the source 2D texture array is 4 and the number of slices needed in the destination 2D texture array is 8. Suppose the source batch size is 5 and the destination batch size is 4. Thus, the number of source slices will be 4*5=20 and the number of destination slices will be 8*4=32. If you want to process image 2 and 3 of the source and store the result at index 1 and 2 in the destination, you can achieve this by setting offset.z=2, clipRect.origin.z=1, and clipRect.size.depth=2. The MPSCNNConvolution object will take, in this case, slices 4 and 5 of the source and produce slices 4 to 7 of the destination. Similarly, slices 6 and 7 will be used to produce slices 8 to 11 of the destination. All MPSCNNKernel objects process images in the batch independently. That is, calling a MPSCNNKernel object on a batch is formally the same as calling it on each image in the batch sequentially. Computational and GPU work submission overhead will be amortized over more work if batch processing is used. This is especially important for better performance on small images. If featureChannels<=4 and numberOfImages=1 (i.e. only one slice is needed to represent the image), the underlying metal texture type is chosen to be MTLTextureType.type2D rather than MTLTextureType.type2DArray as explained above. The framework also provides MPSTemporaryImage objects, intended for very short-lived image data that is produced and consumed immediately in the same MTLCommandBuffer object. They are a useful way to minimize CPU-side texture allocation costs and greatly reduce the amount of memory used by your image pipeline. Creation of the underlying texture may occur lazily in some cases. In general, you should avoid calling the texture property to avoid materializing memory for longer than necessary. When possible, use the other MPSImage properties to get information about the object instead. MTLBuffer and MTLTexture objects are commonly used in Metal apps and are used directly by the Metal Performance Shaders framework when possible. In apps that use CNN, kernels may need more than the four data channels that a MTLTexture object can provide. In these cases, an MPSImage object is used instead as an abstraction layer on top of a MTLTexture object. When more than 4 channels are needed, additional textures in the 2D texture array are added to hold additional channels in sets of four. An MPSImage object tracks this information as the number of feature channels in an image. MPSCNNKernel objects operate on MPSImage objects. MPSImage objects are at their core MTLTexture objects; however, whereas MTLTexture objects commonly represent image or texel data, an MPSImage object is a more abstract representation of image features. The channels within an MPSImage do not necessarily correspond to colors in a color space (although they can, if necessary). As a result, there can be many more than four of them. Having 32 or 64 channels per pixel is not uncommon in CNN. This is achieved on the MTLTexture object abstraction by inserting extra RGBA pixels to handle the additional feature channels (if any) beyond 4. These extra pixels are stored as multiple slices of a 2D image array. Thus, each CNN pixel in a 32-channel image is represented as 8 array slices, with 4-channels stored per-pixel in each slice. The width and height of the MTLTexture object is the same as the width and height of the MPSImage object. The number of slices in the MTLTexture object is given by the number of feature channels rounded up to a multiple of 4. MPSImage objects can be created from existing MTLTexture objects. They may also be created anew from an MPSImageDescriptor and backed with either standard texture memory, or as MPSTemporaryImage objects using memory drawn from the framework’s internal cached texture backing store. MPSTemporaryImage objects can provide great memory usage and CPU time savings, but come with significant restrictions that should be understood before using them. For example, their contents are only valid during the GPU-side execution of a single MTLCommandBuffer object and can not be read from or written to by the CPU. They are provided as an efficient way to hold CNN computations that are used immediately within the scope of the same MTLCommandBuffer object and then discarded. Concatenation is also supported by allowing you to define from which destination feature channel to start writing the output of the current layer. In this way, your app can make a large MPSImage or MPSTemporaryImage object and fill in parts of it with multiple layers (as long as the destination feature channel offset is a multiple of 4). Table 1 shows pixel formats supported by MPSImage. A description of the attributes used to create an MPSImage. Initializes an image from a texture. The user-allocated texture has been created for a specific number of feature channels and number of images. Set (or query) the purgeable state of the image’s underlying texture. The purgeable state of an image’s underlying texture. Parameters that control reading and writing of a particular set of feature channels. Options that define how buffer data is arranged. The device on which the image will be used. The formal width of the image, in pixels. The formal height of the image, in pixels. The number of feature channels per pixel. The number of images for batch processing. The type of the underlying texture, typically MTLTextureType.type2D or MTLTextureType.type2DArray. The dimension of each image, including whether multiple images are arranged into an array or a cube. The pixel format of the underlying texture. The number of bits of numeric precision available for each feature channel. The intended usage of the underlying texture. The options that determine how a texture will be used. A string to help identify this object.